Shown with Model: 21-1524 horn button (sold separately). Black powder coated steel spokes with four chamfered lightening holes. Larger diameter which allows you to now see your gauges clearly. Thick foam grip is made from the "original authentic vintage recipe", and the most comfortable cushion grip on the market. Horn buttons (sold separately) which features GT’s exclusive "Sure-lock" O-ring design that ensures they do not "pop-off" in the middle of the night! 3-bolt mounting pattern, can be used with any GT3-bolt installation hubs and GT3 horn buttons. Click the image below to see our selection of GT3 Horn Buttons. To find the correct installation hub, click on the GT3 Application Guide. Designed to fit our GT3 Installation Hub & GT3 Horn Button. 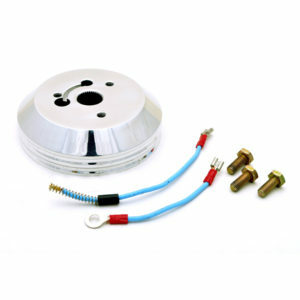 Interchangeable with any standard 3-bolt hub or horn button.